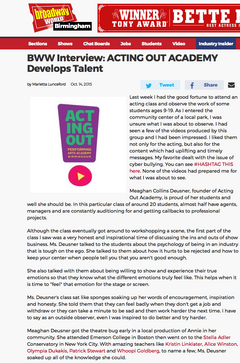 Acting Out Academy is the premiere on-camera acting academy in the greater Birmingham, Ala., area. 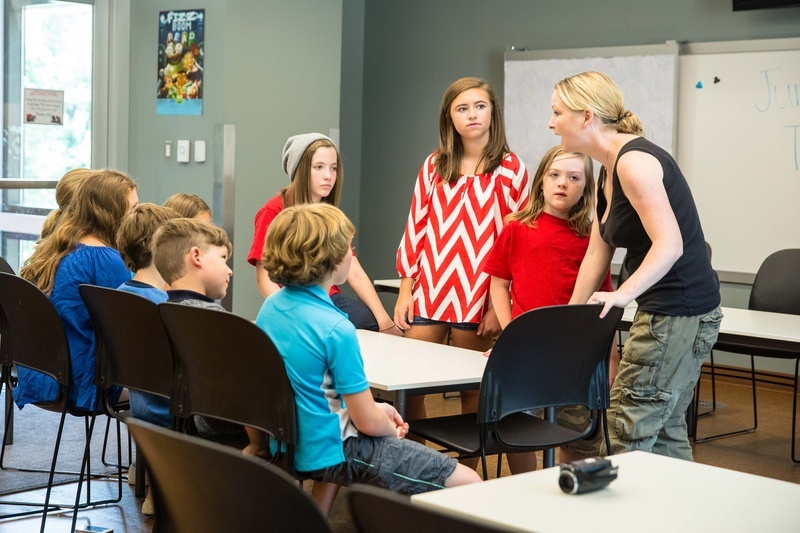 The six-year-old academy focuses on contemporary, on-camera acting, offering classes, audition coaching and taped auditions for kids and adults, along with on-camera private lessons to prepare students for professional opportunities in film and T.V.. 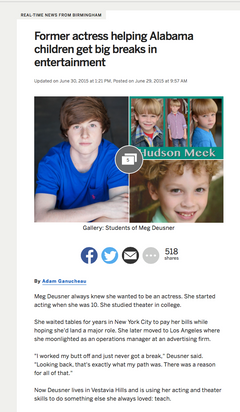 Under the instruction of founder Meg Deusner, nearly a dozen of Acting Out's students have worked professionally in film and T.V. since the school's founding. 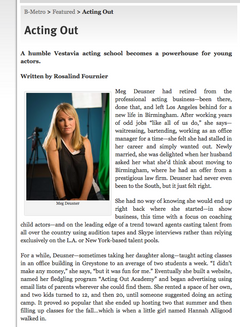 Playing roles in feature films, and national and regional commercials. Acting Out also proudly teaches over 150 kids and adults each year through weekly classes, after-school programs and our wildly popular Movie Camp. In every environment, we combine theatrical play with classical and contemporary technique ? to create a well-rounded foundation in theater arts. Acting Out?s parallel mission is to provide quality performing arts education where it is most needed ? namely, in communities where it is lacking. 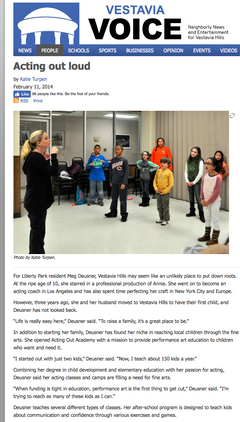 The core of all of our programs is designed to build self-confidence in young people through the performing arts. We strive to reach as many kids as possible through affordable and accessible classes, camps and workshops. We teach acting for film and T.V. with a heavy emphasis on audition technique and interview skills (because you can be the best actor in the world and if can't audition, you won't work). We begin by teaching how 'not' to act. We focus on understanding; where you are, what you are saying, who you are speaking to and how they feel about what is going on and just being 'real' and 'in the moment'. If you are 'acting' you are doing it wrong! Meg started her career in the theater arts as a child in a professional production of Annie, and has been working and training in the dramatic arts for over twenty years, studying at Emerson College and Stella Adler Conservatory. After moving to Birmingham, she continued her education in child development and elementary education at UAB, and soon after launched the Acting Out Academy. She believes that by bestowing on kids the power of self-expression through the performing arts, you are setting them up for a lifetime of social and professional success. She currently lives in Vestavia Hills with her husband and two young children—who always enjoy her theatrics!